What an amazing experience. I definitely need to get out to Oklahoma at some point. It's amazing how many places there is to kayak over there. Awesome Report, I've lived on Lake Eufaula a very long time and have barely explored it. Particularly the southern portion. Its like an ocean. I wonder how long it would take to paddle the whole thing, I may never get to know. I'll have to check back here to find more reports. Have you explored the cove south of Vivian? @Yakker: I haven't visited the Lake Eufaula cove south of Vivian, Oklahoma yet, but it is certainly on the list. One of Dianne's website clients, Sailing Horse Winery, has a private beach and winery on that part of Lake Eufaula. 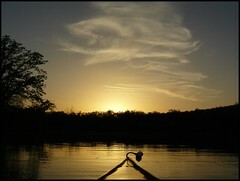 We are hoping to get together a group paddling and wine tasting event there this summer. 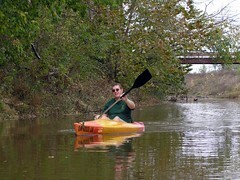 Thanks for visiting the blog, glad you liked the kayak photo. It's been a long winter here but hopefully I'll get out on the water for the first time this season. I live out side Long Town and use a jon boat with a 4 hp motor. The Lake is a way of life and affects everything around it. My home is on an island conected by bridges. It is true that a small conenction of land to the sw exsists on a small ridge, however life is definatley island life. Eufaula is a vast world, which includes the river systems ultimatly concented to the Gulf. As a home it becomes a wonderful backyard of many thousands of acres. Summers around July arn't worth the time as vistors ruin it with high volume traffic and out boards the size of front doors. Spring, and Fall are best, with winter boating being the best if one dresses warmly and is a good seaman. Storms can raise waves and currents strong enough to kill. Fishing is wonderful, and is the partial subsistance of many residents. We live in an isolated place, beside bald eagles and bobcats. Beneath our boat glide the river gar, and blue catfish.